Hi, my name is Arbet, and I own an HTC Magic, which I got from my mobile service provider here in the Philippines. As you may be aware of, the Philippines is not part of the initial Android Market rollout, and we don’t have access to Android Market. As such, if you are only going to release your apps via Android Market, we Filipinos cannot install and use your apps. Take a page from Fring. When Fring released its Android app, I was excited because I like the product/service, but was disappointed because they released it via Android Market. I sent them a message via Twitter, and they gave me a direct download link. Now I use Fring for IM in my Android phone. Please, a direct download URL would do wonders for us. That’s all I ask for. Thank you. Originally posted here. I was trying out Foursquare and Gowalla and both claim they have an Android app. I was frustrated because they only distribute their apps via Android Market. I had to scour the Internet for APKs (these are Android app installers); I found one for Foursquare at their Google Code page (good for them), and a static link for a beta of the Gowalla app. While the Foursquare app works, the Gowalla one does not. So if you notice my Twitter account, you can see me Foursquare checkins, but not Gowalla. If you want your service to succeed, you would want as many people as possible to use your service. Limiting access to your app through a single source that in turn is limited to certain areas won’t help your service. And that is why I am ready to ditch my iPod touch. But that is a different story. CAUTION: This fix will erase everything in your phone memory – messages, contacts, settings. Back up your data before proceeding. Do a software reset. From the Dialer, enter *#7370#. You can now install apps again. Crude, but it works. Ok, so I got this phone last Saturday. Sunday, downloaded some odd number of themes, put them on the phone’s memory card, and installed 3 of them. Installation went fine, and the phone is currently sporting a non-Nokia theme. So, Monday night (last night, dummy), I tried installing the other themes, but I got the “Expired certificate” error message. Thinking that it was a problem with the theme installers, I moved on. Checked the Nokia Download! app on the phone, and tried installing IM+. After downloading (weird, on first download, after reaching 93%, it went back to 0% and started downloading again), the phone displayed its “Preparing installation”, and after a few seconds, “Expired certificate” appeared. Nokia is in for painful headaches. Look at this thread and see some problems being experienced by other owners of this phone. I wish Nokia luck. When you try the Nokia Download! service using your Nokia 5800, you will be shown folders where you can find apps and ring tones and graphics. So I was curious enough to check the Apps folder, and whoah! Several applications, all marked as free! So I tried downloading IM+ (which led me to that expired certificate error last night) earlier via Smart 3G (Smart’s HSDPA at Makati is good). Too bad it’s not really free. After downloading, the phone began installing the app, then I was prompted to select what license to PURCHASE. Yes, you have to purchase a license to use the app. Yes, it is free to download. No, it is not free to use. Nokia Download! ain’t Apple App Store. Try harder, Nokia. And no, Nokia Download Store is not available here in the Philippines. Yet. Just tried the Nokia Barcode Scanner app. It works as advertised. The app is not included in the package, so you’ll have to download it here. Yesterday, the charger for my Nokia 5800 XpressMusic broke down. I was able to use it yesterday, and several hours later, I checked on the unit. The phone battery meter was full and was not moving, indicating that the charging was complete. So to verify, I had unplugged the charger and then plugged it back. Nothing. Tried charging at home – nada. Tried charging an officemate’s phone earlier – nada. Time to visit Nokia Care. Almost a month after I bought the phone. 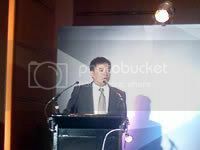 I had an opportunity to test Samsung OMNIA (Samsung SGH-i900) last Thursday at The Peninsula Manila, during its press launch. Here are my impressions. The Samsung people were careful enough not to position this device as their answer to Apple’s iPhone, but the comparison can’t be helped. In fairness to Samsung, OMNIA has several features that iPhone doesn’t, and that clearly differentiates it from the so-called gold standard. First, the touchscreen. I fond of touchscreens, and the OMNIA’s touchscreen is good. It doesn’t come with a stylus (the Samsung people said it will come with a stylus, but the phone does not have a slot for one, so that’s doubtful; they did provide stylus during testing), so you have to use your fingers. The TouchWiz user interface is a Samsung custom UI for Windows Mobile 6.1 Professional. The icons are large enough so that you can easily point to the right icon. What I like about the custom UI is that Opera Mobile is available as an alternative to IE Mobile. This is a great addition. More on this later. Of course, you can revert to the traditional WinMO UI. Haptic feedback is available, but I had it turned off, as I find it annoying. Basically, the phone vibrates every time you press an icon. It is not a useless feature, but as I have said, I am annoyed by haptic feedback, and I felt it is a waste of battery. There is a mouse pointer that is controlled by an optical touch pad below the screen. It is like having a touchpad on a phone. I find it odd, but it has its uses. The on-screen keyboard remains a lot to be desired; people with large fingers will have to get used to it. The keys are too narrow for the thumbs. That is why I think the lack of stylus is a drawback. It has an accelerometer on board, so that when you turn the phone, the UI changes its orientation. The orientation can be sluggish when, for example, Opera Mobile is running and showing Plurk in mobile mode, for example. But that is hardware limitation, which is understandable. Probably one of the best features of the phone is its camera. 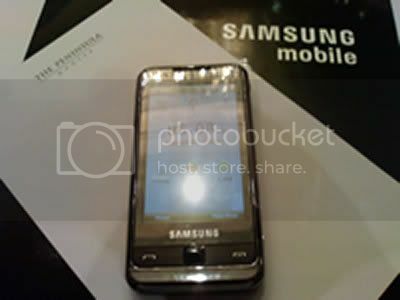 It has a 5-megapixel camera, though the flash is just LED. It has camera functions that are not found in other camera-enabled phones. For example, you can take a panoramic shot with the phone, and you can stitch up to 8 images for a panoramic shot IN THE PHONE. There are other helpful features for taking shots, and I think some of them are quite useful. One problem that I had found with OMNIA is that it runs out of memory that fast. For example, using Task Manager, the apps that were currently running were Main Menu and Task Manager, which consumed less than 1MB of memory combined. But when I tried launching Camera, I got the insufficient memory error message. Good luck running the Camera app while Opera Mobile is loaded. I have not tested the multimedia capabilities of the phone – these features are not on top of my preferences for a phone, and there were no available video files for viewing. The phone is nice when held, though it is shiny and fingerprint magnet. It does not feel flimsy, and you will not be embarrassed to be seen using it. Heck, I’d want this as a phone, though the lack of stylus and keypad would make me pause. 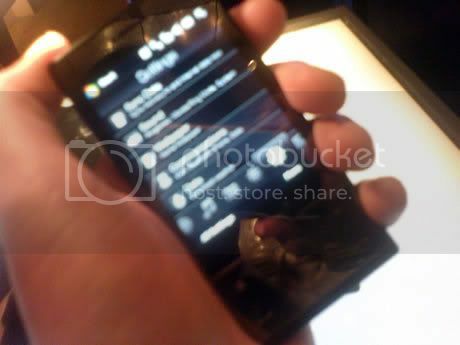 Last Thursday, HTC Southeast Asia (HTC SEA) unveiled HTC Touch Diamond to reporters and bloggers at the Renaissance Hotel in Makati. Some pundits dubbed this as HTC’s answer to Apple’s iPhone, and a reporter asked if this is HTC’s iPhone killer. Kevin Hou (pictured, right), Managing Director of HTC SEA answered this question by saying that they are not out to kill anyone or anything. 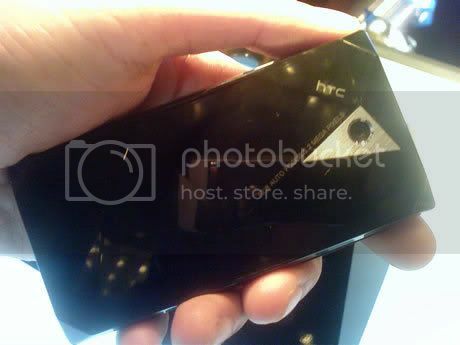 HTC Touch Diamond is being differentiated from the iPhone through its impressive specifications contained within a small phone. I had an opportunity to touch (bad pun, I know) this phone, and indeed it is small. With dimensions of 102 mm x 51 mm x 11.35 mm (LxWxT) and weight of 110 grams (with battery), it is definitely smaller, thinner, and lighter as compared to Sony Ericsson P1i (my current phone). As I had no camera that day, I wish I could have taken a picture of the two phones side by side. But trust me, it is lightweight, and it is easy to handle (another bad pun). The back cover has geometric designs on it, shiny, and fingerprint magnet. The front is smooth, shiny, and fingerprint magnet too. The screen is bright in its glorious VGA resolution – an edge against other phones. 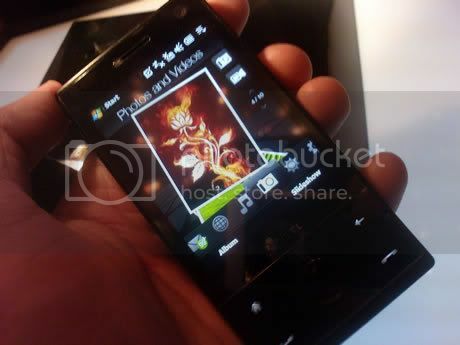 This phone incorporates the latest version of HTC’s Touch user interface (UI). Called TouchFLO 3D, I think it is a nice UI to supplement Windows Mobile’s UI. Some people might call the music interface of TouchFLO 3D as CoverFlow ripoff. I haven’t tried CoverFlow though I had seen it, but TouchFLO 3D is a bit different. Speaking of the UI, it will take getting used to. I have been using touchscreen mobile phones since 2006, and no two touchscreen phones are alike. You will need some time to get used to TouchFLO 3D. It’s intuitiveness is not very apparent at first look, but once you get the hang of it, it works. There’s some lag time at certain places, like viewing a picture full screen. Also, when scrolling on the certain places (like Music or People – the phonebook), the UI seemed to be unresponsive. Maybe that’s just me, or maybe I should have used the stylus. BTW, I like the way the stylus is kept – there’s a magnetic mechanism wherein when you return the stylus, it snaps in. For such specifications, this phone is not cheap. The suggested price is Php 41,800. When asked about the price, Hou said they believe there is market for a phone like this. When someone suggested that HTC should use open source, Hou replied that they do have plans for that (HTC Dream, anyone? ), but they also believe in the partnerships that they have forged through the years, and he reiterated their belief that Windows Mobile is a good operating system. I think HTC Touch Diamond is a good phone, but it is not for your grandparents. However, I am a believer in touchscreen/QWERTY keyboard combo, so if I have the money, I’d rather wait for HTC Touch Pro. Or Sony Ericsson XPERIA X1. Codenamed Paris, this is supposed to be the P5, which allegedly sports the latest version of Symbian UIQ, and a slider with the same rocker keypad (two letters at each end of the button) that P1 and m600i have. It seems that the button is half-white, half-black. To be honest, with EXPERIA X1 in the horizon, I do not see the value of P5 being released within the same period (unless you are not a fan of Windows Mobile). Sony Ericsson should have released this months ago (P1i is already 6 months old). I’m no fan of sliders, though I did own a Nokia 7110. And there is nothing compelling with Paris for me to want it. X1 remains my phone of choice (if I could afford it, of course), unless a 3G Apple iPhone that is not exclusively locked to a single carrier manages to grace these islands. 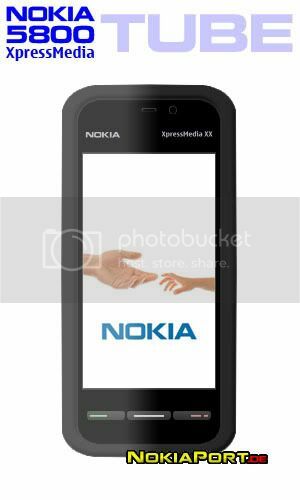 Nokia was in the touchscreen phone business four years ago, with Nokia 7710 as the flagship of sorts running Symbian OS on Series 90 interface. 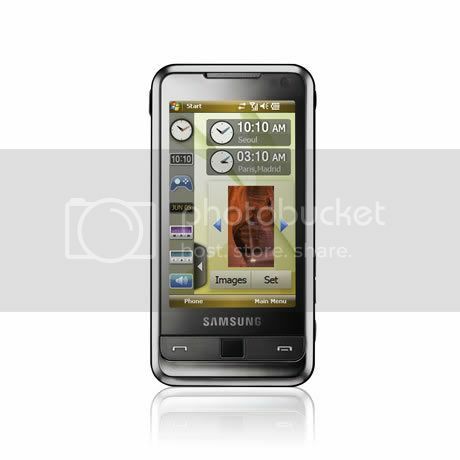 I got this phone December 2005 till I got Sony Ericsson m600i. Nokia 7710 was a bulky phone, and being the only one in the series meant less software. It died a natural death. 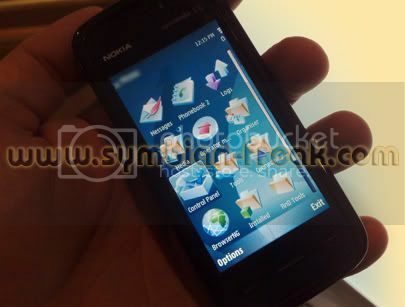 There is also Nokia 6708 (said to be the first touchscreen phone for Nokia). While Nokia 7710 is dead, 6708 seems to live on. But to date, no Nokia touchscreen phone has been released. The Apple iPhone is an eye-opener for Nokia, and is now trying to catch up. 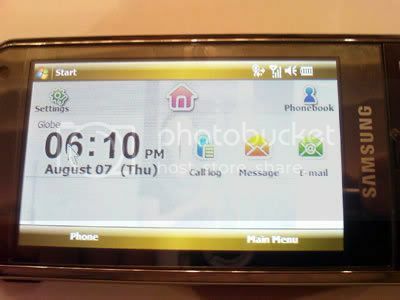 There was a demo of the s60 Touch UI months ago, and now there seems to be a device in existence. Here is the Nokia Tube. Too bad. Nokia had the vision right four years ago, but it fumbled and gave up. Now they play catch-up. Will it be the iPhone killer? Too early to tell, but if that’s their goal, well it is wrong. Nokia should just release a good phone with an intuitive interface, that’s all. Nokia 7710’s UI is good though the phone is slow and heavy.